Home · Posts tagged "Special Olympics CT"
They abandoned all of their comfort and a bit of their dignity last Saturday when they jumped into cold water for a great cause. 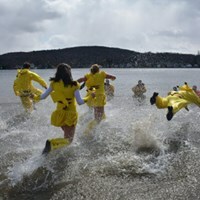 They were the intrepid souls who raised money for Special Olympics Connecticut at the Winsted Penguin Plunge at Highland Lake. The event is billed as the largest grass roots fundraiser in the state for Special Olympics CT, and they proved it Saturday. The group raised nearly $80,000 for the charity which provides year round training and competitions for 12,000 Connecticut athletes with intellectual disabilities as well as Unified Sports which partners SO athletes with teammates without intellectual disabilities. Now the real story at the Winsted Penguin Plunge was the number of young people involved. Groups from Torrington and Pomperaug High Schools as well as the elementary schools of Region 7, and the Boy Scouts from Troop 23 in Torrington plunged in full uniform. I’ve written before about the significant role that our young people play in local charities , and I’ll surely be reporting about it again. Our young people don’t get enough credit for all they do.